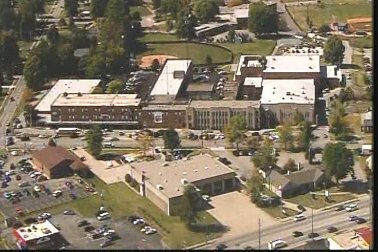 LOUISVILLE, Ky. - One student was injured and one person was being sought after a shooting at a high school in southern Louisville, police said Tuesday. CBS affiliate WLKY reports the injured student is a male. Russell said the suspect left the 1,400-student school immediately after the shooting. Video from television stations showed police escorting students with their hands over their heads out of the school to a nearby softball field. Tiata Rodgers, parent of a senior at Fern Creek, said her 17-year-old son called right after hearing a gun shot. Rodgers lives nearby and made a beeline for the campus. Jefferson County Public Schools spokesman Ben Jackey said the school went into lockdown. After police arrived, students were led out before being taken to an area park for dismissal.